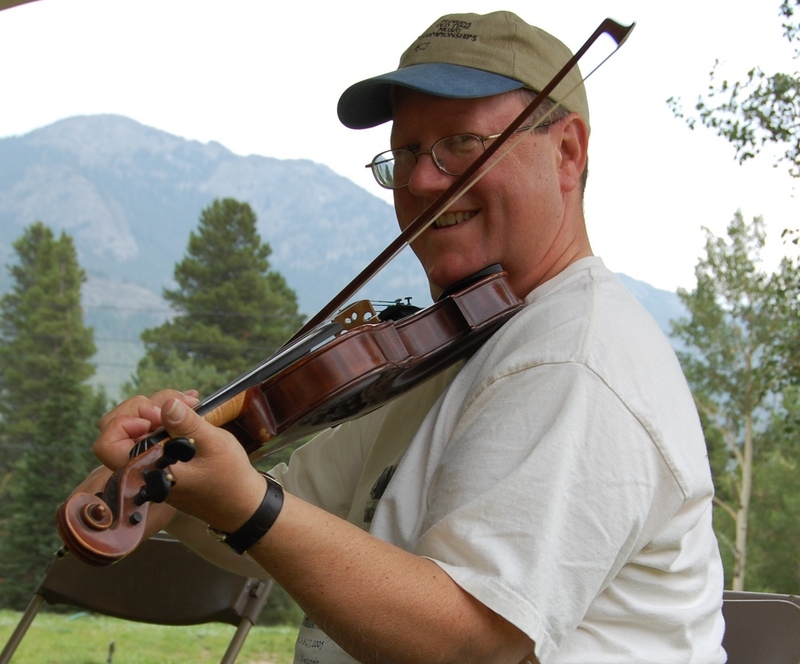 When I started the Fiddle Club of the World (Chicago Chapter) in the spring of 2008, our second featured guest was my old pal and band buddy, Lynn Chirps Smith from LaGrange, Wisconsin. (Of course, we all know he was raised in Charleston, Illinois and spent many years in Grayslake.) Fittingly, Chirps will be the second featured guest in the new incarnation of Fiddle Club in the back room of the Grafton Pub & Grill (4530 N. Lincoln) on Monday, December 10. Come join us at 8pm for a Set* and a Session. ** We plan on doing this every 2nd Monday of the month. ** a jam session for all players. ***There will be a donation jar to compensate the Featured Guest. Come join the fun. So many tunes still to play. Like this one, from April 2008. Fiddle Club is all the way back! I am very pleased to announce that after some dormancy, the Fiddle Club of the World (Chicago Chapter) is back with a regular schedule. Starting November 12 at 8pm, we will have a Set* and a Session** with a Featured Guest*** every 2nd Monday of the month at the Grafton Pub & Grill (4530 N. Lincoln). Come join the fun. So many tunes. So little time. Both Tricia Spencer and Howard Rains grew up in fiddling families in the center of the U.S. Tricia is from Lawrence, Kansas. Howard is from East Texas. The merging of the formidable talents on multiple instruments has produced a great musical whole, larger than the mere sum of the parts. Their twin fiddling is a treat not to be missed. Check out the videos on their website. Scroll down after enjoying the lovely photos and Howard’s artworks. And here are some YouTube videos . 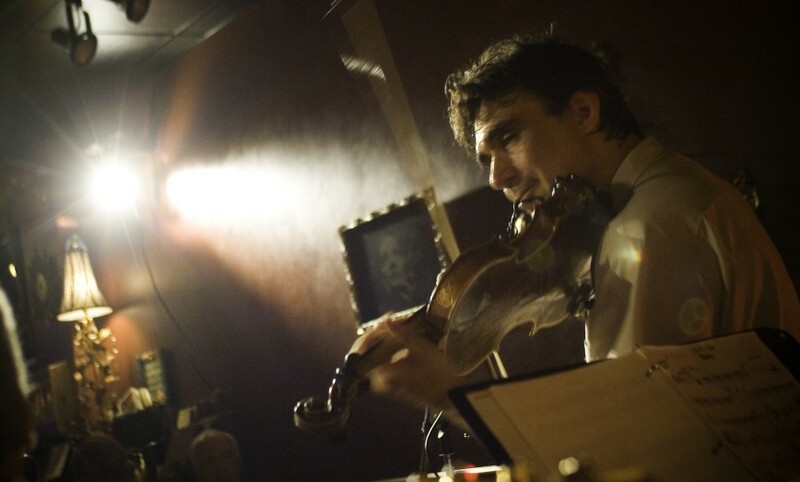 . .
Violinist Steve Gibons is the leader of the Gypsy Ryhthm Project, a unique mix of Western jazz and the rich sounds of Romany music from Roumania and Bulgaria. This event will also be webcast on Concert Window. 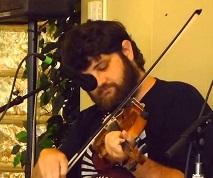 You do not have to be a fiddler to participate in Fiddle Club of the World. We joyously welcome all musicians and all listeners. Admission to both the workshop and the dance is $20. $10 for just the dance. 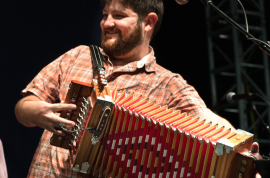 Grandson of well known accordion builder Larry Miller, Blake Miller has been surrounded by Cajun music and culture his entire life. Hailing from the small town of Iota Louisiana, Blake, a fluent french speaker and songwriter, managed to acquire a degree in Francophone studier from The University Of Louisiana at Lafayette and in the mean time founded the popular young Cajun band The Pine Leaf Boys and became a member of the premiere Louisiana roots Band The Red Stick Ramblers. He has also served stints in just about every other cajun/creole band of note including Balfa Toujours, Les Malfecteurs and Cedric Watson & Bijou Creole bringing his strong cultural identity and accomplished musicianship to the world. Now plays with the world traveled Revelers for the past 4 years singing and playing his own songs on fiddle and accordion. 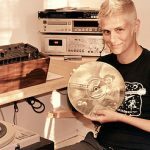 Originally from a small town in Wisconsin, Amelia Biere was exposed to many forms of traditional music at an early age. She grew up listening to her dad sing, play guitar, piano, and fiddle. Fate took her to Minneapolis for college, where there were regular Cajun dances. She got hooked! 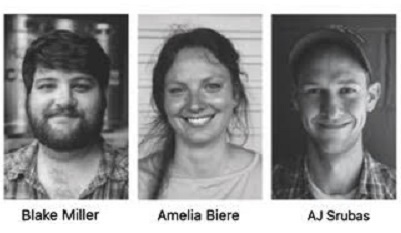 Mentored by a few of the stalwart musicians of the Twin City music scene, Amelia started learning French, playing and singing. Two bands resulted: Ana and the Bel-tones and Millie and the Mill City Heavyweights. In 2014, Amelia decided to move to the source of it all – Lafayette, LA. There she has been soaking it all in, ever expanding her love for the culture. In addition to playing Cajun music, she plays old-time guitar and loves to dance. When not playing music, she is a wedding florist. AJ Srubas is originally from Green Bay, WI where he grew up playing Irish music in a family band. 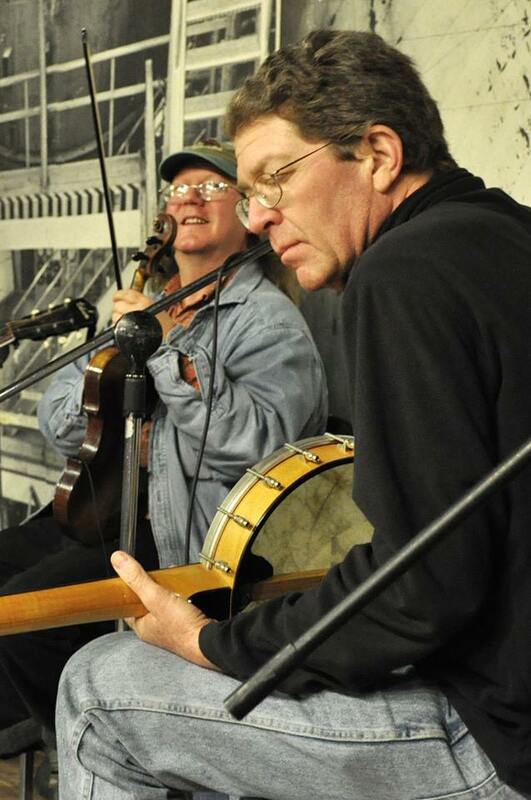 After graduating high school, he went to study fiddle in Ireland for a few months but upon returning home he was introduced to old-time music when his older brother started to learn claw hammer banjo. Before he knew it, he was completely hooked. AJ now lives in Minneapolis, Minnesota and has been playing old-time music for the last decade. 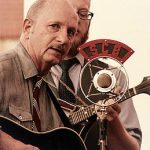 He plays old-time fiddle in the Bootlicker Stringband and Cajun fiddle and pedal steel guitar in the New Riverside Ramblers. When not playing music, he is an apprentice violin bow maker and organizer for The Monday Night Square Dance and other Minnesota festivals. 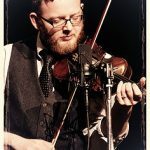 AJ teaches private lessons and has taught at the Central Rockies Old-time Music Association’s summer festival, Berkeley Old-time Music Gathering and many Minnesota Bluegrass and Old-time Music Association events. Fiddle Club meets at Seman Violins (4447 W. Oakton, Skokie). Admission is $20 at the door. Reserve your seat here. Concert set, followed by a jam/workshop. There will be singing. Solid and spirited old-time playing and singing from the Carolinas. Here is where bluegrass and old-time are so intertwined that it’s just great music. Andy, Ivy, and David will entertain us, and then lead us through some tunes and songs, such as these . . . Some hot fiddling to warm our cold winter nights. 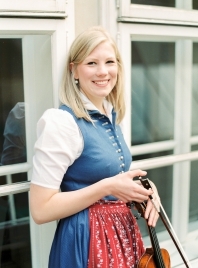 Meetings held at Seman Violins (4447 W. Oakton, Skokie). Admission is $20 at the door. All meetings begin with a short concert followed by a jam/workshop. A fine old-time trio from North [sic] Carolina, the South Carolina Broadcasters are made up of Andy Edmonds, David Sheppard, and Ivy Shepherd. 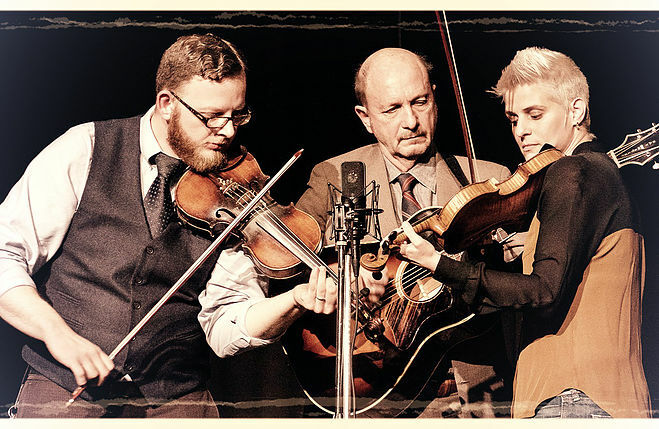 Here’s some key words: “a broad and mature mix of sounds ranging from Surry County bluegrass to Carter Family country and even the Cajun sounds of Lafayette,” so you know what to expect. Here are some more: “razor sharp harmonies, exceptional multi-instrumentation, and fabulous song selection” that will make you want to come out on Friday night in January, whatever the weather. The Broadcasters feature two fiddles, along with banjo, guitar, and more. And did I mention harmony singing? Violinist Steve Gibons is the leader of the Gypsy Ryhthm Project, a unique mix of Western jazz and the rich sounds of Romany music from Roumania and Bulgaria, that includes cymbalonist Nicolae Feraru, whose band was a surprise feature at the Fiddle Club sponsored Battle of the Bands in 2015. The concert this night will feature Steve and an accompanist in a intimate, conversational setting. 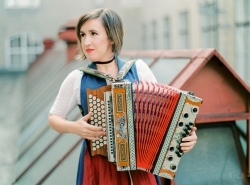 The workshop that follows will introduce us to some common style elements and ornamentation in Klezmer, Balkan and Romany music. Calling by Paul Tyler. Tunes by the Fiddle Club of the World Orchestra.